When you are lost, it is important to have something to guide your way. This is why lighthouses have such a nostalgic feeling to many of us. They point the way home, or point to another stop in your journey. When Gerry and I visit Atlantic City, next month, we will be exploring the Absecon Lighthouse. The lighthouse was first lit in 1857, so it is quite historic. 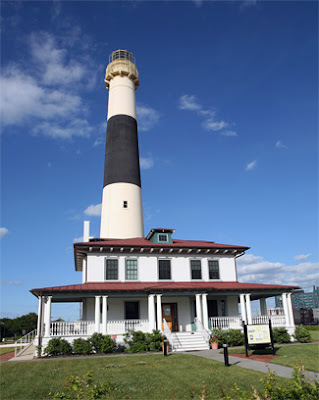 At 171 feet tall it is also the tallest lighthouse in New Jersey and with 228 steps to the top not only will this be a sightseeing expedition but it will also be a workout for us.So we'll have to see if we want to attempt this once we get there! It is the only lighthouse in New Jersey with its original 1st order Fresnel lens still working-the original beacon that guided many ships home. We are so excited to visit this historical marvel, while at the same time explore to magnificent coast of the state of New Jersey.